At Blue Forest we love discovering treehouses that push the boundaries of style, design and technological features, so we were excited to hear about Jono Williams, an ambitious New Zealander who recently finished constructing an impressive solar-powered treehouse called the Skysphere. Williams has taken the idea of the “man-cave” to the next level with the ten metre tower, three years in the making, which cost a cool $67,600 to complete. Unlike Blue Forest’s more natural approach to treehouse construction, the Skysphere is made from solid steel and looks like it has just landed in the fields of New Zealand from outer space! There are, however, solar-panels which help power the construction and Williams is committed to making the treehouse as environmentally friendly as possible. One of the most impressive features is the 360 degree window, which gives Williams a fantastic panoramic view of the surrounding scenery. Like Blue Forest’s High Tech Hideaway, the Skysphere uses fingerprint technology to identify visitors and has a whole host of cool tech features including voice-controlled LED lighting and a state-of-the-art wireless sound system, all of which Williams is able to control from an android app. In the near future Williams plans to add a bathroom of some kind to the tower, and hopefully to begin the construction of a house able to run completely on renewable energy. 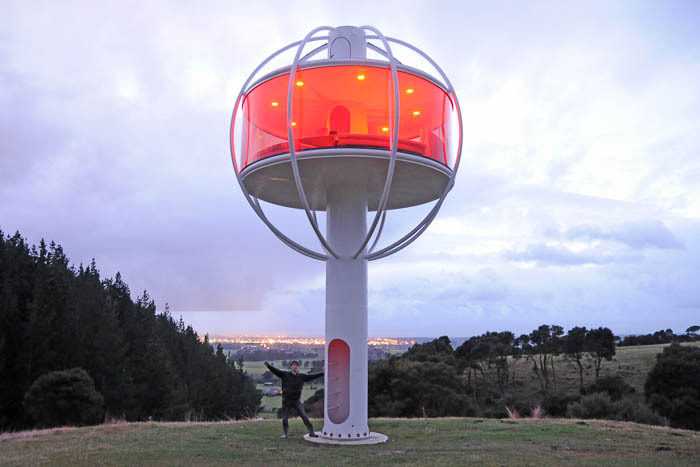 The Skysphere is certainly an interesting and unique structure, although it is missing one vital feature: a bathroom! 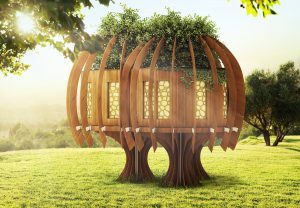 The solar panels will go a long way to making this treehouse environmentally friendly, although Williams still has some work to do if he wants the Skysphere to be function completely on renewable energy. The Skysphere has loads of really cool and clever features, we especially like the beer-dispensing couch and the use of an android app as a handy control centre! With thanks to Jono Williams for letting us use his images. Image Copyright: Jono Williams.